When Nick Purvis and his brother Sam opened Good Coffee in 2014, it was the culmination of years spent working in cafés and gleaning ideas from around the world. Time with companies like Verve, Coava, and Barista shaped the Purvis’s appreciation for, well, good coffee, inspiring them to launch their own cafés. 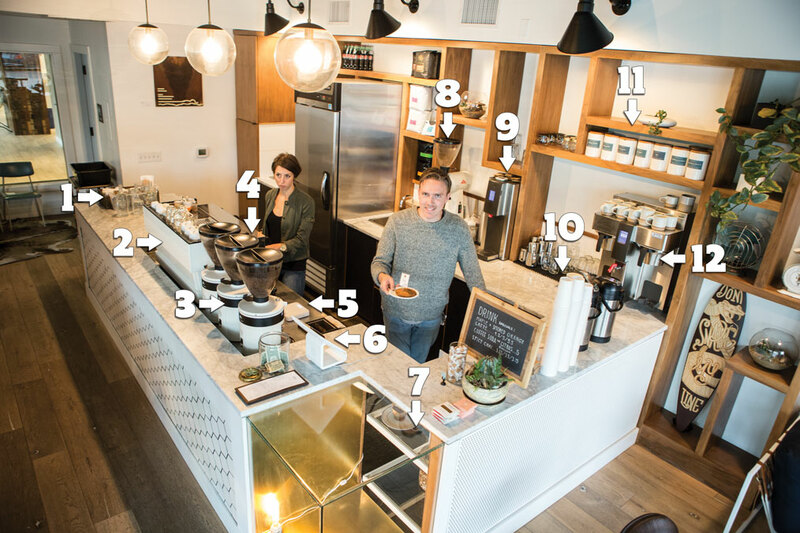 Good Coffee opened two locations just months apart, both in southeast Portland. “We’ve always talked about owning a company together and being in the coffee industry together. It all happened at once,” Nick says. He describes the design as heavily Scandinavian-influenced, and can pinpoint elements of the café that were inspired by places he and Sam either worked in or visited. At the Division Street location, a wall of built-in shelving features nooks sized according to their contents, modeled after similar shelves seen at The Mill in San Francisco and Toby’s Estate’s Brooklyn location. A couch and chairs create a lounge area, an element the Purvis’s were set on having. “We’re both very design-oriented,” Nick says. “We’re always thinking about design and aesthetic, and wanting things to look beautiful.” They were drawn to cafés with simple decor, where the energy of the café was the aesthetic. At the Division Street café, the bar is highly polished, yet simple. Baristas use pitcher position to indicate drink types, allowing Good Coffee to be a paperless café. The barista on register takes point on drink prep, so all the supplies needed to serve brewed coffee or weigh ingredients are easily within reach of the point-of-service. An all-white, two-group Linea Classic doesn’t bear any of the usual La Marzocco branding—Good Coffee had it customized to match the minimalist feel of the bar. Nick says they’ve made a few layout changes on bar since opening, all in the name of accessibility—and keeping things as visually simple as possible. “It’s about setting your team up to be able to crush high volume,” he says. 1) Condiment Caddy: Water service and condiments are kept on the end of the bar so baristas can easily monitor and restock supplies. Cream is stored in the back refrigerator and pulled upon request. 3) Triple Peaks: A trio of Mahlkönig Peaks grind from hoppers holding decaf, espresso for milk-based drinks, and a featured selection. 4) Hidden from View: A pitcher rinser boosts efficiency on bar. Alternative milks are stored beneath the espresso machine. 5) Dose-si-do: Acaia scales weigh all doses and yield. 6) Paperless Café: Good Coffee doesn’t print any tickets, instead using signals like pitcher placement to let the other baristas know what’s been ordered. 7) Pastry in Motion: A sliding track lets the barista easily pull out a pastry when it’s ordered, then slide them back into their featured place at the bar’s corner. 8) Specialized Grind: A Mahlkönig EK 43 on the back bar is reserved for cold-brew, drip coffee, and coffee purchased from their retail shelves. 9) Water on Demand: A Fetco HWD-2110 dispenses water at up to four different temperature pre-settings using a digital touchscreen, making it easy to dial in water for various brew methods. 10) Speedy Takeaway: To-go cups stack next to airpots of batch-brewed coffee, streamlining the process of ordering a quick coffee to go. 11) Nooks ‘n’ Crannies: Built-in shelves are sized according to their contents. Tea canisters tuck neatly above the hot water station, and five-pound coffee bags nest near the EK 43.